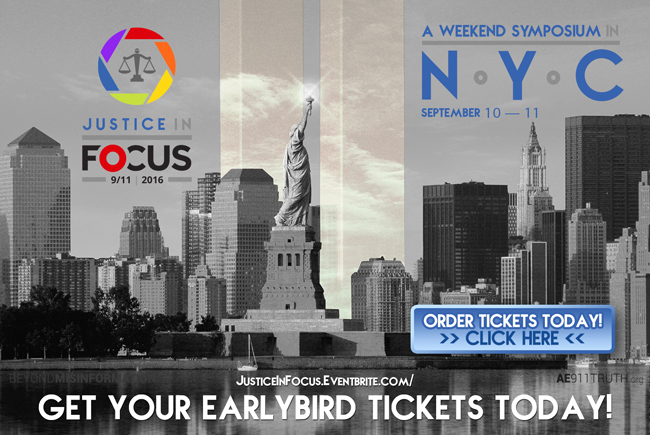 Justice in Focus: Who will be speaking?! Just Twelve Days Left to Buy Early Bird Tickets! AE911Truth, the Lawyers Committee for 9/11 Inquiry, and other co-sponsors are hosting a landmark symposium on the pursuit of 9/11 Justice fifteen years after the fateful events of September 11, 2001. Join us in the historic Great Hall of New York City’s Cooper Union on September 10th and 11th and be a part of the discussion with this outstanding lineup of speakers, which is listed below. Plus, listen to Richard Gage discuss the Justice in Focus program on last week’s episode of 9/11 Free Fall Radio — and see below for our recommendations of the most affordable and convenient accommodations. Richard Gage, AIA, and Dr. J. Leroy Hulsey, P.E., S.E. Legal Standards Applied to the Evidence: Is a Grand Jury Warranted? Traveling to NYC for this historic conference? For affordable options close to Cooper Union, we recommend checking out the Jane Hotel and Hotel 17. You can also search for budget options on Hostels.com.